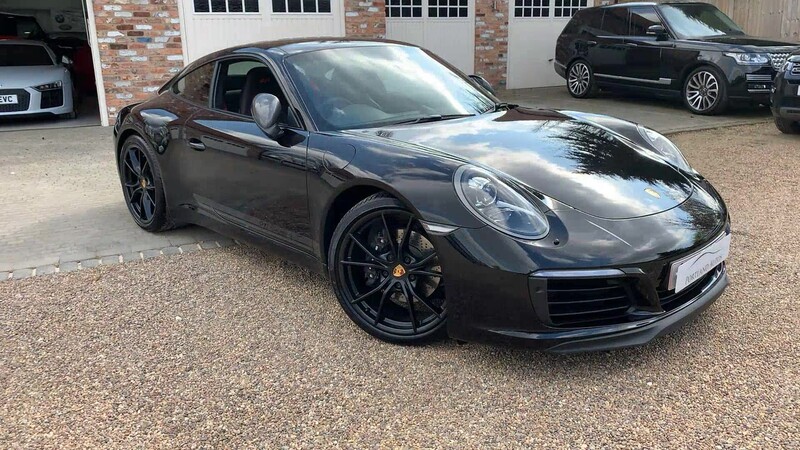 2018/18 PORSCHE 911 CARRERA T IN JET BLACK WITH BLACK AND RED INTERIOR, ONE PRIVATE OWNER FROM NEW WITH JUST 4500 MILES. SPEC INCLUDES £2500 WORTH OF PAINT PROTECTION FILM AND DETAILING/5 YEAR CERAMIC COATING APPLIED FROM BRAND NEW, BLACK LEATHER INTERIOR IN COMBINATION WITH CARRERA T INTERIOR PACKAGE, CONTRASTING COLOUR IN GUARDS RED WITH STITCHING, BI-XENON MAIN HEADLIGHTS INCLUDING PORSCHE DYNAMIC LIGHT SYSTEM (PDLS) PARK ASSIST FRONT AND REAR, ELECTRICALLY FOLDING EXTERIOR MIRRORS, ELECTRIC TILT/SLIDE SUNROOF, PRIVACY GLASS, HEADLIGHT CLEANING SYSTEM COVERS PAINTED, PDK GEARBOX, CHRONO PACKAGE INCLUDING PORSCHE TRACK PRECISION APP, 20 INCH CARRERA S WHEELS PAINTED IN SATIN BLACK, CRUISE CONTROL, AUTOMATICALLY DIMMING MIRRORS WITH INTEGRATED RAIN SENSOR, SPORTS SEATS PLUS (4-WAY ELECTRIC) SMOKING PACKAGE, PASSENGER FOOTWELL STORAGE NET, ISOFIX CHILD SEAT MOUNTING POINTS ON FRONT PASSENGER SEAT, INTERIOR PACKAGE CARRERA T, REAR SEATS, DIGITAL RADIO, PORSCHE COMMUNICATION MANAGEMENT INCLUDING ONLINE NAVIGATION, SPORTS EXHAUST, SPORT AND SPORT PLUS MODES, USB AND AUX CONNECTION, BLUETOOTH AUDIO STREAMING, BLUETOOTH AND TRACKER. 2xKEYS, HPI CLEAR, FINANCE AVAILABLE, PART EXCHANGE WELCOME, TO VIEW UP TO 40 HD PHOTOS AND A HD VIDEO OF THIS VEHICLE PLEASE VISIT OUR WEBSITE.